Juicy Watermelons on my Nails - Tutorial With Steps.. Please Be Mine (2) "
Now come to the tutorial ..
3- Small dotting tool, a wide brush..
1- First put the cello tape in a manner to form a cone shape on nail excluding the ring finger and thumb.. See the picture.. Then apply a transparent base coat to protect nails. Now Apply the pinkish red shade.. 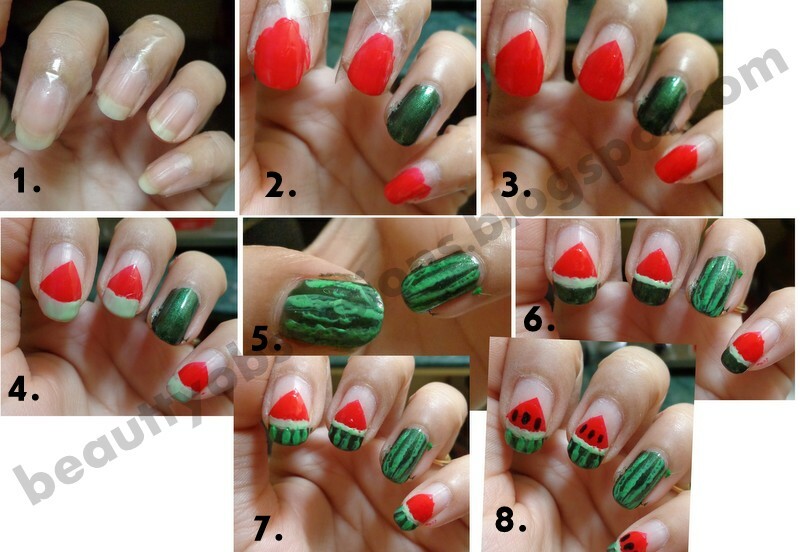 Here i have taken pinkish red shade because the inner part of water melon is not pure red ..
2- Then put off the tape carefully.. Now apply a pista green shade on the outer edge of nails to form like a French mani..
3- Then when it will dry apply another layer of dark green polish like shown in picture.. In between paint the ring finger and thumb with dark green polish.. Here we will make the peel of watermelon ..
4- Now it's time to add some details to the peel.. Take the neonish green shade and draw rough lines on the peel through a wide nail brush.. Remember the lines should be rough and improper..
5- Now continues the same process to other nails as well.. Here i haven't any neonish green shade,so I added a pista green shade to a green shade and got this required shade.. Now time to add seeds to the watermelon.. Take the small dotting tool and draw three to four seeds on nails as per your choice..
6- After drying out everything apply a thin layer of top coat.. Finish..
Hope you all liked it.. Stay tuned to get more tutorials like this... Bye..
Its so cute :) Easy to do as well! He he he... thank you.. The accent nails look so realistic! Love your nail art. Looks pretty. This is so cute. I am tempted to eat watermelon now. Owwiiii this is so cute darling !!! ❤️❤️❤️❤️so love it !!! So lovely, it gives the feeling of icy watermelon in hot summer day! !